KARMA RESORTS HAS ANNOUNCED A PARTNERSHIP WITH BALI RUGBY CLUB WHICH SEES THEM BECOME THE OFFICIAL MAIN SPONSOR FOR THE KARMA BALI RUGBY FEST. Karma Resorts is delighted to announce their partnership with Bali Rugby Club to sponsor the Bali Rugby Fest Rugby for the upcoming 2017 Tournament. The Bali Rugby Union is happy to announce Karma Resorts has secured the naming rights to the Annual Bali Rugby 10’s Tournament on the weekend of October 14-15, 2017. This will be the 22nd year that Bali Rugby Club will be hosting the premier Rugby event in Indonesia and we look forward to another successful year. We are also please to announce our rugby for change initiative in Bali of which Karma has been a massive driving force behind. 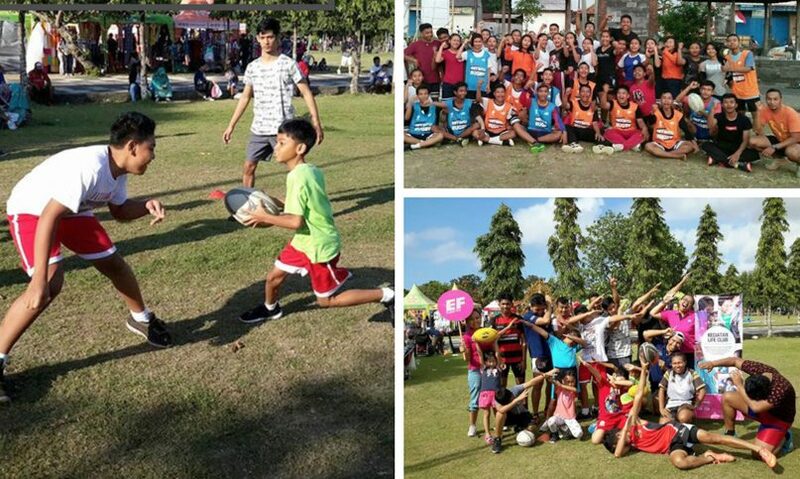 The initiative is set up to bring Rugby to under privileged kids and orphanages throughout Bali. Karma has always had a deep commitment to helping to develop rugby at the grassroots level and this is demonstrated through a number of initiatives and the involvement of their Brand Ambassadors, who also assist with Karma’s extensive work with the Bali Life Foundation, providing rugby coaching clinics. Karma Resorts and Karma Group are active supporters of rugby with the announcement earlier this year of a three-year sponsorship of Rosslyn Park HSBC National Schools Sevens, the world’s largest school rugby tournament, where they launched a fantastic competition for all Rosslyn Park HSBC National Schools Sevens Tournament schools to win the chance to be coached by a former England Player or Coach in the run up to the 2017 tournament, plus a one week team training camp in a 5-star Karma Resort in Bali. They have also sponsored the English 7s Team. Karma has also recently highlighted their commitment to developing the future of English rugby with their sponsorship of Senior Rugby at top English rugby school Brighton College. The sponsorship at Brighton College will provide the teams with a plethora of additional training opportunities, including the professional recording of matches for analysis and subsidised tours throughout the year. Karma Resorts is delighted to announce their partnership with the Rugby Football Union (RFU) to sponsor England Sevens Rugby for the upcoming 2017/18 season. This includes all ten legs of the HSBC World Rugby Sevens Series, the Gold Coast Commonwealth Games in 2018, including a training camp at Karma in Bali, and the 2018 Rugby World Cup Sevens in San Francisco.